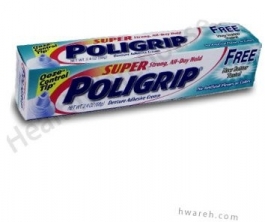 Super PoliGrip Free Denture Adhesive Cream - 2.4 oz. Poly (methylvinylether / maleic acid) sodium-calcium mixed partial salt, petrolatum, cellulose gum, mineral oil. - Using too much adhesive can cause oozing. Use a small amount and add more if necessary. - Clean and dry your dentures. - Squeeze tube from the top and apply a small amount of adhesive in dashes or strips (not too close to denture edges). - Rinse mouth before inserting dentures. - Press dentures in place, hold firmly and bite down for a few seconds. - Swish mouth with water. - Take dentures out slowly by using a rocking motion. - Wipe adhesive residue from gums and dentures with a soft, moist cloth. - Brush dentures under running warm water and soak in Polident cleanser. - Keep cap and nozzle dry so that the opening does not clog. - Keep the tube at room temperature for easy squeezing. - Consult your dentist for periodic examination of your dentures. Ill-fitting dentures may impair your health.